Netflix announced the upcoming availability of its iPhone app back in June. Today, the company made the app available to everyone with an iPhone and a iPod Touch. The app is a free download, however it does require a subscription to Netflix to play videos. Videos from customer’s Instant Queue can be streamed right to their device over Wi-Fi or 3G. Check out the full press release after the jump. LOS GATOS, Calif., Aug. 26 /PRNewswire-FirstCall/ — Netflix, Inc. (Nasdaq: NFLX) today announced the availability of its free Netflix App for iPhone and iPod touch, allowing Netflix members on plans starting at just $8.99 a month to instantly watch a vast selection of TV episodes and movies streamed to their iPhone or iPod touch at no additional cost. 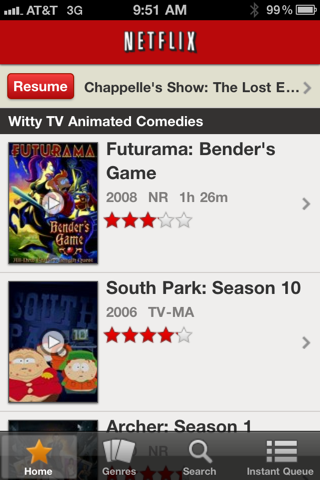 The Netflix App is available for free from the App Store on iPhone and iPod touch or at www.itunes.com/appstore/. The Netflix App delivers a high-quality viewing experience, a broad array of movie and TV choices and a clean, intuitive interface. It is available via both Wi-Fi and 3G networks. TV episodes and movies are conveniently organized into a variety of categories based on members’ personal preferences, popular genres, new arrivals and members’ individual instant Queues. Members can choose a movie or TV episode from any of the lists and just tap the innovative Multi-Touch user interface to watch instantly or to save the title for viewing later. Additionally, users have the option of fast-forwarding and rewinding the video stream, and stopping at any time. When users want to start watching again, the video stream starts exactly where it was stopped, even on a different device capable of streaming from Netflix. With more than 15 million members, Netflix, Inc. (Nasdaq: NFLX) is the world’s largest subscription service streaming movies and TV episodes over the Internet and sending DVDs by mail. For $8.99 a month, Netflix members can instantly watch unlimited TV episodes and movies streamed right to their TVs and computers and can receive unlimited DVDs delivered quickly to their homes. With Netflix, there are never any due dates or late fees. Among the large and expanding base of devices that can stream movies and TV episodes from Netflix are Microsoft’s Xbox 360, Sony’s PS3 and Nintendo’s Wii consoles; Blu-ray disc players from Samsung, LG and Insignia; Internet TVs from LG, Sony and VIZIO; the Roku digital video player and TiVo digital video recorders, and Apple’s iPhone, iPad and iPod touch. For more information, visit http://www.netflix.com.